Shopping for a wedding dress can be pretty overwhelming. You visit lots of bridal shops and try on tons of different dresses, but none of them is quite what you imagine. In this article, we will give you some tips what dress would look good on a tall and thin bride. When shopping for a wedding dress, consider your proportions.If you have a long torso, it’s not a good idea to wear a drop-waisted dress, because it will make it look even longer. But it will look good on you, if your torso is shorter, and your legs are really long. An A-line dress flares out gently from the shoulder, creating a subtle A shape. It can look good on almost anyone, but some models have very fitted tops, which would be uncomfortable for bigger busts. Ball gowns usually have a fitted top and a bell-shaped, floor-length skirt. This type of dress looks best on tall brides, while shorter brides can get overwhelmed by the full skirt. Ball gowns are usually worn for more formal weddings. Keep in mind that the corseted top may be pretty uncomfortable. The empire waistline starts just below the bust and the rest of the dress drops straight down. This type of dress looks best on tall, thin women. If your body is fuller somewhere in the middle, you might end up looking pregnant. The mermaid type of dress looks very modern and elegant. It fits tighter to the hips, then flares out at the knees. Tall women look really fantastic in mermaid dresses. However, do not wear this type of dress if there are any parts of your figure that you would like to minimize. Also, consider if your ceremony will require kneeling, because in this case the dress might not work for you either. 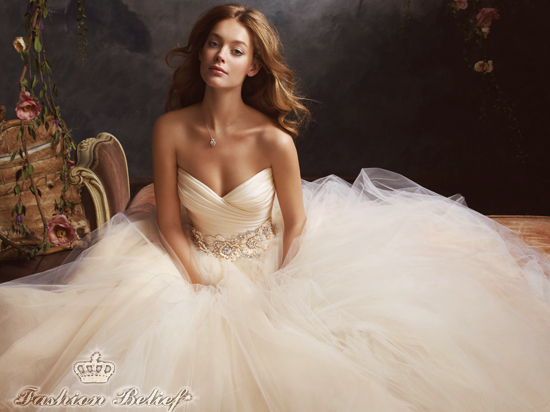 The princess dress is another type of dress that can look good on almost anyone. The top part has some vertical panels of fabric, then the skirt flares out gently. It gives you a classic, feminine look, but may not suit everyone’s taste. The sheath dress has a very simple, but modern and elegant style that “hugs” all of your curves. It is perfect for very tall, thin brides. The slip dress has a very elegant style. It is usually made of satin and clings to your body. It would be a good choice, if you are looking for that old-school Hollywood glamour. It looks best on tall, thin women, with smaller busts. Having a super model body doesn’t necessarily mean that every dress would look good on you. It’s all about proportions. Also, consider the style of the ceremony – would it be classic and more formal or modern and elegant. Try on different dresses and choose the one that looks best on you and feels the most comfortable.